In May 2010, at the Accademia Nazionale dei Lincei in Rome, art historian and restorer Antonio Forcellino presented a case for two additions to Michelangelo's small catalogue of "portable" paintings. The two small panel paintings depicted a Pietà and a Crucifixion, the former in a private collection in New York, the latter at Oxford University. These findings were published in an Italian journal in June 2010, with a narrative version of the story released in English in May 2011. The following post aims to create a detailed but concise distillation of the evidence presented across these and related publications, in the interests of public accessibility. In May 2011, the New York Times posted an article summarising the key figures involved. The driving force of the investigation was Martin Kober of Tonawanda New York, whose family has owned the Pietà panel for generations. Seeking answers beyond family legend, Mr. Kober began an investigation into the history of the work - eventually forming a partnership with Italian restorer and Michelangelo expert Antonio Forcellino. 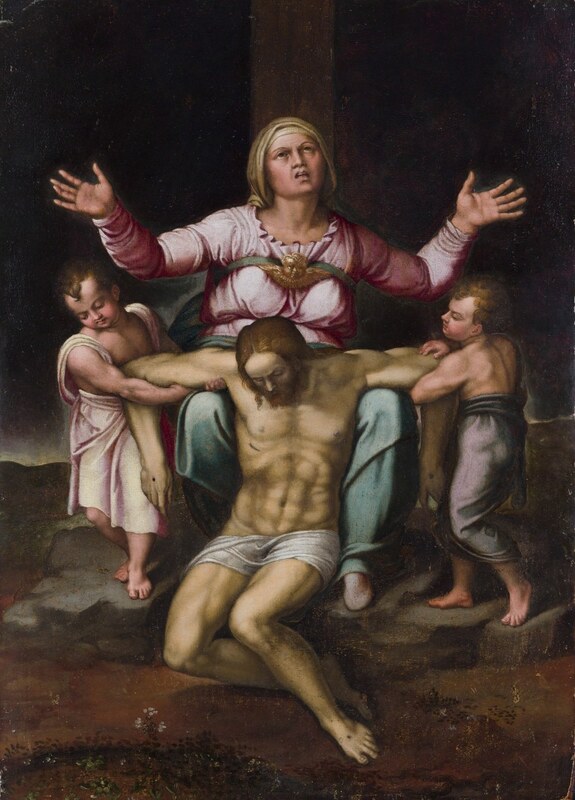 Despite being perceived as a newly discovered Michelangelo painting, the Pietà had actually been published as such in 1868, and exhibited in 1885 as a Michelangelo work at the Metropolitan Museum in New York. However, subsequent scholarship disregarded the piece, through what seems to be the result of a perpetuation of bias towards Vasari, who only mentions the work as a drawing. It was only recently discovered documentary evidence that provided the spark to re-examine the accounts of Michelangelo's very small catalogue of portable paintings and the Pietà once attributed to him. Before proceeding, I would like to re-iterate I do not have a personal stance on the authenticity of either piece. The process of authentication is of greater interest to me, particularly in this instance, with the great challenge of condensing a very large amount of data into a succinct account. There can be no doubt Antonio Forcellino is passionate about his work. Reading his narrative account, translated in this instance by Lucinda Byatt, one gets a sense of intense emotional experiences as he went from one stage of the investigation to another, often guided by very little other than a hunch or old photograph. That Forcellino has spent much of his working life examining, cleaning and restoring works by Renaissance artists (particularly Michelangelo) makes him suitably qualified to review the technical aspects of evidence submitted, as well as physically describe the paintings in a manner a more theoretically oriented art historian would struggle with. At some point, a decision was made to present this information to a general audience in the form of a first person narrative related by Forcellino. The story is indeed intriguing, involving historical glimpses into the Catholic response to the Reformation, and the prominent role played by the small coastal town of Ragusa, now known as Dubrovnik in modern day Croatia. The following descriptions will hence focus on the two works presented as attributed to Michelangelo. It should be noted that the amount of detail on the Oxford piece is somewhat less in the book, as this side of the investigation seemed to have caught all parties by surprise, and is ongoing. What information is presently available, is summarised below. It is also acknowledged that investigations into the New York Pietà are also ongoing. The documentary sources are complex, and essentially the foundation upon which this investigation was launched. To summarise, detailed documentary and provenance timelines are listed below, clarifying source from extrapolation made by interpreting scholars. I have also included both of Vasari's accounts in their original Italian along with a translation, due to the great debate over the interpretation of the word disegno, as well as indicated the original references to the words quadro and dipinto in other letters. Indeed, while Cardinal Gonzaga's first reply to Bertano - in which the Cardinal accepted the quadro - could be brushed aside as a misunderstanding (Bertano offers Gonzaga a drawing [disegno], but Gonzaga thinks it is a painting [quadro]), the discovery of the second reply dated, 11 June 1546 dispelled any remaining doubts. In this second letter, Gonzaga insistently asked for the quadro that Pole had taken to Trent, since he wanted Giulio Romano to copy it. Both sets of correspondence - Gonzaga's and Vittoria's - back each other up, showing that the only ambiguities lie in Vasari's account. There is no doubt that Michelangelo produced at least two small devotional paintings. A major premise of the book, and Michelangelo scholarship has revolved around his involvement in a religious movement known as the Spirituali, which surmises these works were created in support of their cause. It is beyond the scope of this article to explore this contentious topic. It is sufficient to say Michelangelo was familiar to each of the listed individuals, which can be established from documentary sources, including his own letters, particularly to Vittoria Colonna. For the sake of clarity, the key characters are listed below. Cardinal of Mantua. Son of Isabella d'Este and brother to Eleonora d'Este. It is reported Ercole inherited his mother's great love of art, and records attest to his great admiration of Michelangelo. Giulio Romano, formerly a student of Raphael is the artist working for the Cardinal in Mantua. Marchioness of Pescara and celebrated poet. From extant letters between her and Michelangelo, and other sources, it appears the two had a great affinity and shared devotion. It is argued her support of the Spirituali is demonstrated by her affiliation with Reginald Pole, Michelangelo and Ercole Gonzaga among others - and resulted in her donating a painting produced by Michelangelo to Reginald Pole. Reginald Pole English Cardinal with close family ties to the monarchy. A key member of the Spirituali. Affiliated with Cardinal Pole are two associates who occupied the position of Archbishop in Ragusa, Ludovico Beccadelli and Christostomo Calvini. Cardinal Bertano of Fano is noted as accompanying Pole to the Council of Trent in 1546. Another confederate is Alvise Priuli, Pole's devoted aid. For some further background into the key figures and beliefs of the Spirituali, please watch the following excerpt from Michelangelo Revealed, a PBS documentary featuring Antonio Forcellino, Alexander Nagel and historian Thomas F. Mayer. All these documents permit us to rectify Vasari’s account and certify that around 1545 at least two paintings and one drawing existed. One of them was a wooden panel painting representation of the Pietà for Vittoria Colonna and given by her as a gift to Pole. Another was a wooden panel painting representing a Cruciﬁx, in reality a Cruciﬁxion with the Virgin and St. John at the foot of the cross, given as a gift to Tommaso Cavalieri. 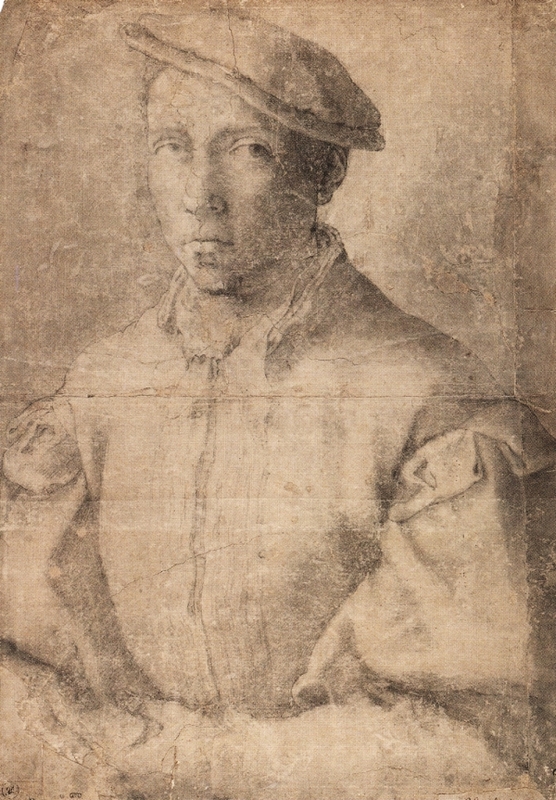 The third was a drawing of the same (probably one of the preparatory drawings) given as a gift to Vittoria Colonna. Note: Readers interested in a detailed account of the documentary sources are invited to expand the following timeline section. ?1545 ?Summer. A letter from Vittoria Colonna to Michelangelo. Reportedly first published by Herman Grimm in Das Leben Michelangelo (1860-63). Translated from the Italian version in Forcellino's June 2010 article by Prof. Judith Mazziotti. Li effetti vostri eccitano a forza il giudizio de chi li guarda e per vederne più esperienzia parlai di accresscer bontà alle cose perfette. E ho visto che omnia possibilia sunt credenti. Io ebbi grandissima fede in Dio che vi dessi una grazia soprannaturale a far questo Cristo. Poi il viddi si mirabile, che superò in tutti i modi ogni mia espettazione: poi fatta animosa dalli miracoli veduti, desiderai quello che ora meravigliosamente vedo adempito, cioè che sta da ogni parte in somma perfezione, e non se potria desiderar, né giunger a desiderar tanto. E vidico che mi rallegro molto che l’Angiolo da man destra sia assai più bello, per-ché il Michele ponerà voi Michelagniolo alla destra del Padre, nel dì novissimo,e in questo mezzo io non so come servirvi in altro che in pregarne questo dolce Cristo, che si bene e perfettamente havete dipinto, e pregar voi mi comandiate come cosa vostra in tutto et per tutto. Your works assuredly stimulate the learning of the onlooker and I wanted to add with words [that your works also stimulate] even more goodness in things already perfect. And I have seen that all things are possible for those who believe. I was of very great faith in God that he would give you a supernatural grace to make this Christ.Then I saw it [was] so admirable that it exceeded in all ways every one of my expectations: then emboldened by the miracles seen, I wanted that which now I see marvelously revealed [accomplished], that is to say, [that]which is in every part the summit of perfection and one could not desire, nor succeed in desiring so much. And I tell you that it gladdens my heart that the Angel at theright [of Christ] is so much more beautiful, so that in the very newest day [when you get to heaven] the [Archangel] Michael will place you, Michelangelo, at the right hand of the Father, and for now I don't know how to serve you in anything other than to pray to this sweet Christ, whom so well and perfectly you have painted and to pray you will command me, as if I were yours, in everything and for everything. 1545 ?August/September. Published by Giuseppe Campori in 1866. A letter from Vittoria Colonna to Michelangelo. Its exact date is not known, but extrapolated from other sources. Translated by Prof. Judith Mazziotti. Cordialissimo mio signor Michelagnolo, Ve ne prego me mandiate un poco il Crucifixo, se ben non è fornito, perché il vorria mostrare à gentilhomini del reverendissimo cardinal de Mantova, et se voi non seti oggi in lavoro potresti venir a parlarmi con vostra commodità. Most cordially my sir Michelangelo, I beg of you to send me the Cruciﬁx for a while, even if it is not ﬁnished, because I would like to show it to the gentlemen of the most Rev. Cardinal of Mantua, and if you are not at work today, could you come to speak to me at your leisure. 1546 [date estimated between February and March] - A letter from Michelangelo to friend Luigi del Riccio describes Michelangelo's anger at the circulation of the print. Translated by Lucinda Byatt in the 2011 Forcellino book. Gaetano Milanesi, who published a version of Vasari's lives in the nineteenth century surmised that the letter may possibly refer to the creation of an engraving created by Giulio Bonasone, but was not certain. Forcellino, comparing Bonasone's engraving and the painted version of the Pietà, suggests that the engraving of was made from a drawing and not the painted version. 1546 May 12. A letter from Cardinal Bertano on behalf of Cardinal Reginald Pole to Cardinal Ercole Gonzaga. First published in 1907 by Karl Frey. Translated by Prof. Judith Mazziotti. Mons. Polo ha per notizia ch’ella desidera un Cristo di mano di Michelagnolo et ha imposto che io intenda secretamente la verità di cotal suo desiderio. Per che essendo in effetto egli ne ha uno di man propria del detto, che volentieri gli e le manderebbe, ma è in forma di pietà, pur se gli vede tutto il corpo. Dice che questo non sarebbe un privarsene per ciò che dalla Marchesa di Pescara ne puo havere un altro. Vostra Signoria Illustrissima me ne scriva. Monsignor Pole has heard that you desire a Christ by the hand of Michelangelo and that this wish should be kept secret. He has one already by the hand of the above-mentioned that he would gladly send you, but it is in the form of a pietà, yet one can still see the length of Christ’s body. He says that this would not be a hardship because he can get another from the Marchioness of Pescara. May Your most illustrious Lordship reply to me. 1546 May 21. Cardinal Gonzaga replies to Cardinal Bertano - a letter discovered in 1991. Translated by Prof. Judith Mazziotti. Monsignor mio come fratello quando mi possiate far haver quello quadro della immagine di Christo del Re.mo Polo per questo effetto solo ch’io lo possa farcopiar da mr. Giulio romano nostro qui e remandarglielo, mi sarà rarissimo haverlo quando mo la cortesia del cardinale volesse passar questo segno vi dico liberamente che non intendo ch’egli se ne privi in alcun modo non sapendo ove meglio possa star l’immagine di Christo che nelle mani di co lui che lo porta per fede sculpito nel cuore. 1546 Spring - Vasari, having been in Rome since 1544, returns to Florence. Quando prima v.s. mi mandera il quadro del R.mo Polo, l’havero più caro per farlo subito copiare e rimandarlo a S.R.ma. The sooner your Lordship sends me the painting belonging to the Most Reverend Cardinal Pole, the more delighted I shall be to arrange for it to be copied immediately and returned to His Most Reverend Lordship. ?1545-6 A letter from Vittoria Colonna to Michelangelo. Published in 1866 by Giuseppe Campori. Translated by Prof. Judith Mazziotti. Unico maestro Michelangiolo et mio Singolarissimo amico, Io ho hauta la vostra e visto il Crucifixo, il quale incrocefisse nella memoria mia quante altre pitture viddi mai. Non si puo vedere più ben fatta, più viva e più finita imagine; e certo io non potrei mai explicar quanto sottilmente e mirabilmente è fatta. Per il che son risoluta di non volerlo di man d’altri. E però chiaritemi; se questoè d’altri, pazienzia; se è vostro, io in ogni modo vel torrei. Ma in caso che nonsia vostro e vogliate farlo fare a qualche vostro, ci parleremo prima, perché conoscendo io la difficoltà che v’è ad imitarlo, più presto mi resolvo che co lui faccia un’altra cosa che questa. Ma se è vostro, abbiate pazienzia che non sonper tornarlo più. Io l’ho ben visto al lume e col vetro e col specchio, e non viddi mai la più finita cosa. Al Comand.° Vost.° La Marchesa di Pescara. [My] only master Michelangelo and my most extraordinary friend, I have yours and [have] seen your Cruciﬁx, which crossed and ﬁxed in my memory as many other paintings [as] I ever saw. One cannot see [one] better done, more alive and more accomplished an image; and certainly I couldn't ever express how subtly and admirably it is made. For this reason I have resolved not to want the work of others' hands. And however [do] clarify for me if this is someone else's, [In that case I must exercise] patience; if itis yours, I at any rate would take it from you. But in case it is not yours and you should want to make it one of yours,we will speak to each other ﬁrst, because knowing the difﬁculty myself of copying it, I'd end up sooner [with it if] that man made something different from this one. But if it is yours, have patience that I am not [about] to ever return it to you. I saw it well at the lamp and with the glass and with the mirror and I never saw a more accomplished thing. At your command, the Marchioness of Pescara. 1550 Giorgio Vasari - in the first edition of his Life of Michelangelo. From the 1997 publication by Einaudi, translation provided by Dr. Edward Goldberg. Ha meritato ancora Michele Agnolo che la divina Marchesa di Pescara gli scriva, et opere faccia di lui cantando, et egli a lei un bellissimo disegno d’una Pietà mandò da lei chiestoli. In addition, Michele Agnolo was worthy of having the divine Marchesa of Pescara write him and produce works praising him, and he sent her a most beautiful drawing of a Pietà which she requested of him. 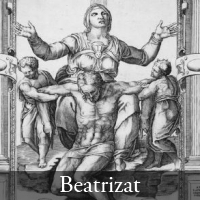 There was a requisition made by this Woman, for an unclothed Christ, when taken from the cross, which as a dead and abandoned body, he would fall at the feet of his most holy Mother if not for being held up by the arms by two small angels. But she, staying seated under the cross with a tearful and pained face, raises both her opened hands and her arms saying what one reads in the trunk of the cross as written: "They think not how much blood it costs." The cross is similar to the Bianchi cross in the time of the plague of 1348. It was bought brought by procession, and then was placed in the church of Santa Croce in Florence. Out of love for her he also made a disegno of Jesus Christ on the cross, not seeming dead but still alive, with his face raised to his father...where you see that body, it is not a dead abandoned body falling, as commonly portrayed, but is a body in bitter torment, resentful and writhing. Forcellino clarifies this point succinctly in his June 2010 article in Annali della Scuola Normale Superiore di Pisa. Condivi is probably referring to the drawing because in the previous six years the painting was neither in Michelangelo’s workshop nor was it in Rome. Almost certainly Condivi is talking about the preparatory sketch, the only one still in Michelangelo’s workshop and of the numerous etchings dating from 1546 where we can see how the cross’ details correspond to Condivi’s description. 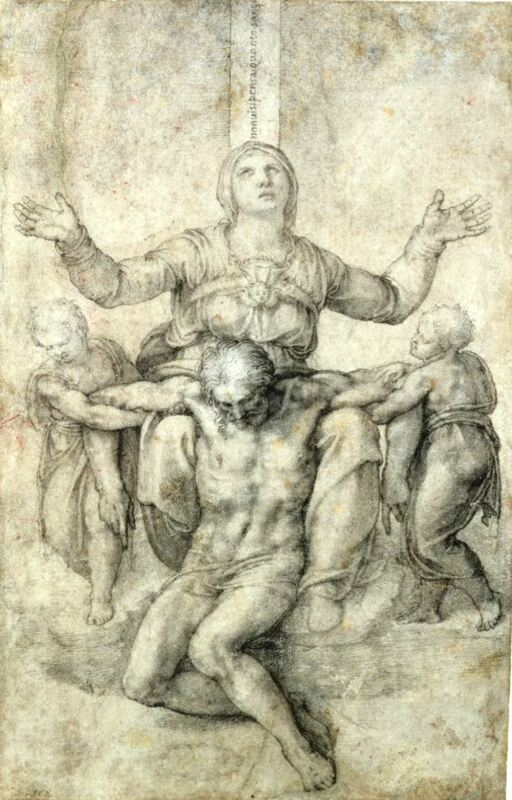 …e le disegno Michelangelo una Pietà in grembo alla Nostra Donna con dua Angioletti, mirabilissima , ed un Cristo confitto in croce, che, alzato la testa, raccomanda lo spirito al Padre: cosa divina; oltre a un Cristo con la Samaritana al pozzo. At this point, it is important to delineate between the factual provenance of the piece owned by Martin Kober and the speculated provenance argued by Forcellino. The factual provenance refers to verifiable records of the physical item. Ideally it should mention dimensions, other identifying marks on the front or back of the panel. Hence, the factual provenance of the painting can be traced back to the description by Herman Grimm first published in 1867, which describes its dimensions. A full transcript of the 1840 report by Bizarro was not sighted in sources examined - it is presently unknown if it cites the dimensions of the painting he saw. The provenance before this point appears to be based on extrapolation from documentary sources, and from markings on the back of the panel. This may seem like nit-picking but it is important to state this clearly from the outset. Source: speculated from letter dated May 12 1546. 1558 Cardinal Pole dies. As part of his estate it is surmised Priuli sends the painting to Ragusa, destined to be received by Beccadelli. By 1559 Beccadelli leaves Ragusa and Christostomo Calvini occupies the position of acting Archbishop until 1564, when the position is officially conferred. Source: this information is provided from Church records, primarily from Ragusa and the Vatican. It should be clarified there is no known record of Pole's ownership of the painting beyond the letter, and no record of its delivery to Ragusa. The first actual documented appearance of the painting is in 1840, although the wax seal of the Tempestivi proves the panel was in Ragusa in the early 17th century. 1602 The will of Flavio Tempestivi, the Archbishop of Ragusa between 1602-1616. The will lists objects of a devotional nature brought by Tempestivi from Italy, which does not include the painting. The will also describes that existing devotional objects from the residences of the Archbishop were to be taken to the Cathedral. It is argued the Tempestivi wax seal on the back of the panel was likely added at this point. An appendix in this will states that some of these objects were sold to pay for various expenses. Listed among buyers of these items is Simone Giovanni Gozze whose descendants were the next to be reported with the painting. It should be noted the will does not specify the Pietà panel or its sale to the Gozze. Hence, this step in the provenance is an extrapolation from the available documents. 1840 Balduin Bizzaro, described as an "erudite Ragusan" writes an account of viewing the painting in the collection of the Gozze. He reports that among the Gozze it is celebrated as a painting by Michelangelo. 1865 Friedrich von Lichtenberg travels back to Germany, marries Baroness Johanna von Lilien. 1866 Letters of Vittoria Colonna describing paintings executed by Michelangelo published by Campori. 1867 Spring Grimm mentions the Ragusa panel in this year in the article Pieta Michelangelo’s – Basrelief in Pisa, published in Über Künstler und Kunstwerke, vol. 2 (1867), issue IX/X, pp. 77-79. He cites insufficient evidence to link authorship to Michelangelo, and maintains the attribution to Marcello Venusti. 1868 Attributed to Michelangelo in the third edition of Leben Michelangelo's (Michelangelo's Life) by Herman Grimm. 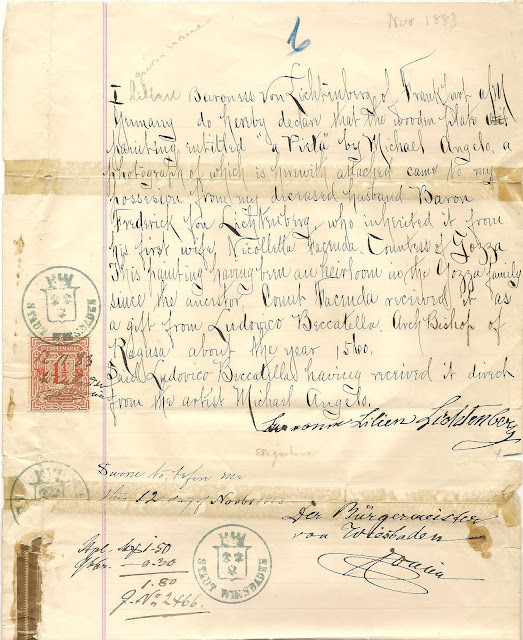 1883 Johanna von Lichtenberg sells the painting to Baroness Villani, who ships the painting to the US to sell it (accompanied by a note dated November 12, 1883 explaining its provenance - see image below). 1883 Painting arrives in the US with the hope of it being sold. The painting never enters the market. Forcellino states the painting was subjected to an "inexpert restoration" at this point, but a record outlining details of this is not present in the sources sighted. 1885 Exhibited at the Metropolitan Museum of Art in New York in the winter of this year. 1901 Painting exhibited at a museum in Syracuse (New York) in the latter part of this year. 1901 Baroness Villani legally bequeaths the painting to her companion and "chaperone" Gertude Young, a distant maternal relative of present owner. There has been comparatively less written on the iconography of the piece. Depictions of a grieving virgin cradling Christ's body are known as Pietà scenes, which were of course prevalent in the Renaissance. Among more recent accounts, Kristina Hermman Fiore explores the meaning of the design in greater detail. Raising the arms upwards toward the height of the sky was a sign of "victory" with reference to that of Moses over the Amalekites, described in the Book of Exodus of the old Testament (Exodus 17, 8-16). Moses on that occasion was seated on a rock and his arms were held up by Cur and Aaron. In the drawing however the two angels at their posts do not hold up victorious arms of the Madonna, but rather those of Christ. The gesture of the raised arms of the Madonna in the Michelangelo's include a probable allusion to the name "Vittoria" Colonna. A similar gesturing towards the heavens is already present in Paleo Christian iconography of the catacombs as a sign of victorious prayer for example in the murals of St. Agnes in Rome noted already in the 1500s. Drawings, engravings and painted copies show an inscription on the cross: "Non vi si pensa, quanto sanque costa" Fiore describes this as "a fundamental documentation" of the spiritual ideas expressed in canto XXIX, 91-92 of the Dante's Paradiso, "They think not how much blood it costs" which is followed by the following verses "to plant it [faith] in the world and how pleasing it is/ to the one who humbly approaches it." The New York version does not depict this - subsequently its appearance in other versions is cited as proof of Venusti and other copyists working from a drawing and not the panel that was passed from Colonna to Pole and then to Ragusa. The trail of drawings, copies and engravings seem as equally complex as the documentary sources. Forcellino's presentation outlines that subsequent painted, engraved and drawn copies seem to have stemmed from an original drawing and not the painted version of the piece, which, together with the underdrawing revealed by infrared scans, show a unique version of the composition not replicated in copies. "Several" are reported, the most notable of which are at the Telyer Museum in Haarlem, and the version in the Isabella Stewart Gardner Museum in the US - the latter being generally, but not unanimously accepted as an autograph drawing by Michelangelo. At least two other versions of the Pietà are attributed to Marcello Venusti, an associate of Michelangelo and copyist of his works. One is in the Galleria Borghese and another larger version in a private collection in Turin. Reported by Balduin Bizarro in 1840, its traditional attribution to Michelangelo by its owners described. Attributed to Michelangelo by Herman Grimm in 1868. Exhibited as a Michelangelo at the Metropolitan Museum in 1885 and Syracuse Museum New York in 1901. The Pietà hence went unremarked for over a century, until the investigation initiated by Martin Kober. The attribution to Michelangelo was first presented by Antonio Forcellino at the Accademia Nazionale dei Lincei on May 14, 2010, with a subsequent journal publication in the Annali della Scuola Normale Superiore di Pisa. The English narrative version of events, The Lost Michelangelos was published in May 2011. As a hypothesis, in the Ragusa Pietà we could be dealing with the second version of the painting after that one painted for Vittoria, done for Cardinal Pole, with the sketch for the composition done by the master and the pictorial part entrusted to a qualified collaborator. But then as opposed to the drawing in Boston, the painter of the Ragusa Pietà simplifies the anatomy of the muscles, breaking Christ's clavicle, reducing the curves of the outline of Christ's body. Besides that, it makes a swollen hand of one of the angels, seen from the back come directly out from the neck without the space of air between the chin (double in the painting) rendering the face of the angel in a clear profile and different from the [underlying] drawing. The master of the Ragusa Pietà also then paints the proportions of the son's head strangely small with respect to those of his mother, despite being farther from the observer. As for the proportions of the Virgin's hands, actually the left, more distant hand, appears larger than the right and closer hand. The wrists of the hands and Christ's ankles, which in the drawing makes you feel the bones protruding, in the painting vice versa end up looking reduced and flattened. Visible light analysis indicates "clumsy" overpainting on Christ's face and chest and the left portion of Mary's face. Technical analyses were conducted on the Pietà at the University of Buffalo in New York. No signs of image transfer method were seen, but instead a finely executed underdrawing displaying an anatomical accuracy congruent with known Michelangelo drawings. The examination of the Oxford version was undertaken to provide a more complete picture of the copies attributed to Venusti. To the great surpise of all, a refined underdrawing and style of brushwork was also noted in the Oxford version, leading to Forcellino's proposal of Michelangelo as its author. A more direct link exists between the Oxford version and a known associate of Michelangelo. In this instance, the Crucifixion was believed to have been given to Tommaso de' Cavalieri. The reverse side of the Oxford version bears a reported nine crests of the Cavalieri amily. The piece was sold to British artist and art dealer Robert Fagan in the latter part of the eighteenth century. Tomasso de Cavalieri is described in a recent Michelangelo biography by Michael Hirst as a "passionate attachment [that] would, in succeeding years, change into a friendship that would last until [Michelangelo's] death". Over thirty years junior to the famed artist, Tomasso is reputed to be the subject or inspiration of at least fourteen sonnets, a number of poems and other artworks. Traditionally attributed to Marcello Venusti. Attribution to Michelangelo published in 2010 by Forcellino. A copy attributed to Marcello Venusti is located in the Galleria Doria Pamphilj in Rome ; another version whose authorship is less certain is in the Casa Buonarotti in Florence. A related drawing of a Crucifixion is in the British Museum, with other sketches at the Louvre. 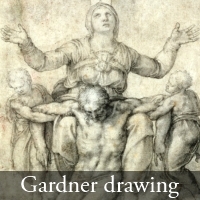 In the course of his examination, Forcellino also discovered a previously unpublished engraving of the Crucifixion in the Isabella Stewart Gardner Museum, which he argues is derived either from the original drawing for the painting or the painting itself, owing to key similarities not present in the copies. The engraving then, faithfully records several details that correspond both to Michelangelo’s drawings as well as to Cavalieri’s painting, such as the positioning of the folds of John’s cloak, his hair that comes down to touch his right hand, and the folds on the left arm that reach to the height of his bicep, missing from both the Doria and the Buonarotti House replicas. The faithful rendering of the end of Christ’s loin cloth in the engraving is signiﬁcant, while the loin cloth in the two Italian replicas was erroneously portrayed. Even the bodily part of Christ visible under the transparent loin cloth in the British drawing as well as in the Oxford painting is easily discernible in the engraving, whereas it appears to have vanished in the Venusti replica at the Doria Gallery. Forcellino's book is aimed at general readers, yet from the information presented above, one can get a sense of the complexities involved in describing the artistic process of a Renaissance master such as Michelangelo. As a non specialist reader, I was often left with the sense that Forcellino was forgetting his target audience. As a restorer, he of course can clearly understand the nuances between an engraving, a cartoon, a copyist work. He makes some effort to explains these, but their disjointed presentation makes them difficult to follow. In comparison, Kemp/Cotte's publication of La Bella Principessa was logically presented, with discrete sections focusing on historical and stylistic analysis, and a plain language summary of technical data. It is hoped a revised edition of this book will include a section summarising data and documentary findings. Until then, it is difficult to recommend it as a useful research resource over the website, journal and catalogue articles (or even this post) which more succinctly present this data. If readers prefer to focus on the story of the investigation and the emotional responses of the researchers, the book is a unique glimpse at the unsung heroes of the study of Renaissance art. Embedded into this story is a valuable lesson about the value of primary sources as evidence. 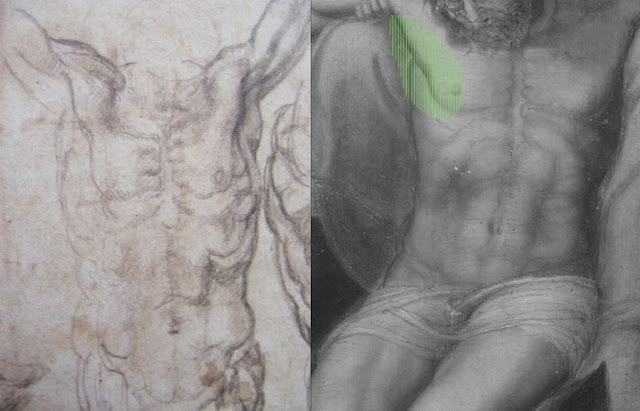 A culture of omission seems to have plagued Michelangelo scholarship in this example - the perpetuation of a bias towards Vasari's description of a drawing over correspondence published in the 1860s - which more clearly refer to painted works. How the Oxford and New York panels will be accepted into the enduring canon of Michelangelo's works remains to be seen. From the sizeable amount of documentary and technical evidence presented by Forcellino and his colleagues, any contest to either attribution must also bring an equivalent or superior degree of evidence to account. *Dr. Edward Goldberg for providing both iterations of Vasari's descriptions and their translations. *Mr. Martin Kober for providing access to material used in the preparation of this review. If you would like to keep up with ongoing developments in this story, please visit the website dedicated to the painting, which features images and documents related to the investigation, including a blog tracking the progress of the restoration of the Pietà. *A special thanks also to Professor Judith Mazziotti whose English translations of the original Italian articles and technical reports were invaluable in assembling this summary. *Many thanks to Christian Opitz and Dr. Robert Bock for providing the clarifications regarding the evolution of Herman Grimm's commentaries on the painting in German. Thanks once again, Hasan, for the clear and concise presentation of the facts in the case--and congratulations! Many of us, alas, need as many lessons as we can get on the responsible use of primary sources. Is the term "culture of omission" your own? In any case, I like it a lot! Cheers Ed. I am pleased this information is accessible to anyone interested. Being so heavily involved in Raphael sources at the moment, jumping into this storm around Michelangelo was somewhat daunting - I can only hope I have done the facts some justice. In any event, "culture of omission" is mine - it was sparked by the translation of the June 2010 journal article, which states the history of the painting is a "history of critical obliteration" (la storia di una cancellazione critica). Fantastic work! In my view this is your most epic piece. Like you I am not one to express opinion on the authenticity of either paintings. I too am very interested in their journeys. Would you be able to shed light on just one more document?? For the benefit all those interested, could you please elaborate more on the letter discovered by Dr Forcellino that is discussed in the 39th minute of the PBS film that you cite? Has the letter been published or discussed anywhere, and if so where? Has the nature of the drawing mentioned (which was brought by Michelangelo to the 1543 Spirituali meeting) been identified? Could you publish the letter here??!! Among other places in this entry, you list 'A painted Pietà and Crucifixion, and a drawing of the Crucifixion.' So is this the subject of the 1543 drawing? 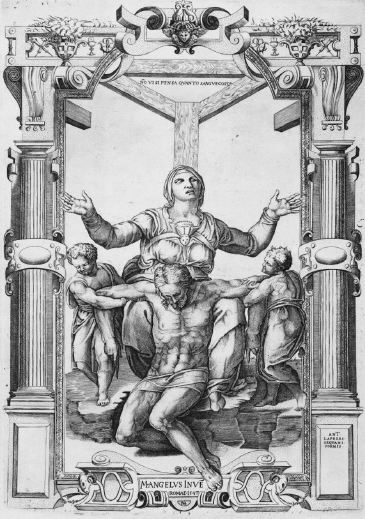 If so which Crucifixion drawing does it refer to exactly (probably the BM's, but I'm not sure because the BM date it to a few years earlier, between 1538-1541)? Congratulations on your work and, on the behalf of all your avid readers, thank you! @Anon/N - that documentary was based on Forcellino's other publication(s) on Michelangelo and the Spirituali. The excerpt created was simply to introduce the figures involved. As I indicated, it is a contentious topic on which there is no universal agreement - and best left to others to sort through. The equally treacherous topic of arguing dates of drawings is something which I also did not want to get mired in - and has been written about at length in other publications - the focus here is on the paintings. It will be interesting to see how Hirst will handle these issues when he comes to the second volume of his Michelangelo biography. Thanks for replying. Sorry for going off-topic in my previous comment, but I truly think the letter discovered by Forcellino, describing the 1543 meeting that Michelangelo attended, is very interesting for Michelangelo scholarship (in general). If it were not for this film, I wouldn't have been aware of its existence, so I thank you for bringing it to our attention! Like your article, it was very engaging. In your research for the above article, have you come across a scholarly reference to the letter? As an art student, I definitely look forward to future pieces. Do you think you'll ever review Nagel's 'Michelangelo and the Reform of Art'? @Anon/N - The best place to start looking for this document which has engaged your curiousity would probably be Forcellino's 2009 book, "Michelangelo - A Tormented Life" also published by Polity. I have no plans to review Nagel's Michelangelo volume, but will be reviewing his "Controversy of Renaissance Art" at some point. I also look forward to reviewing Hirst's new Michelangelo biography as well. I would advise readers to try stay on topic of course. Thanks for the summary of this fascinating case and for distinguishing what is known from what is merely assumed! I must admit, I have one small quibble concerning Herman Grimm’s contributions to the case. Since my native language is German, I was interested to read that passage you quote from his “Life of Michelangelo” in the original and went to find it on google books. As it turned out, this was like opening Pandora’s box, and made me realize that there are some inaccuracies in the account you give of Grimm’s contributions. Now I’m aware that, apparently, you were relying on the information provided on Mr. Kober’s website – and why wouldn’t you – but unfortunately it appears that Mr. Kober’s website in this respect is, well, unreliable. Herman Grimm’s “Das Leben Michelangelo’s” first appeared in two volumes in 1860/63, a second revised edition followed in 1864. F. E. Bunnett’s English translation was published in 1865, a slightly revised edition came out in 1866. None of these editions contains any reference to the Ragusa panel. As you mention in your post, they do include a footnote referring to a painting of the Pietà in Berlin "erroneously attributed to Sebastiano del Piombo." On closer inspection it becomes quite clear though that this cannot be identified as the painting from Ragusa: For once, Grimm says that the pseudo-Sebastiano painting “is in the Berlin Museum” while the Ragusa panel was only sent to Berlin to be sold but failed to attract a buyer – it’s quite unlikely therefore that it ever was in any museum. More importantly, comparing it to the known engraving(s), Grimm states that the pseudo-Sebastiano painting only contained “the lower half of the composition, i.e. Christ with the two angels”. And most importantly, in the 1868 edition of his “Leben Michelangelo’s” Grimm claims to only have seen the Ragusa panel “the year before”, i.e. in 1867. And indeed, Grimm first discusses the Pietà from Ragusa in an article published in 1867: “Pieta Michelangelo’s – Basrelief in Pisa”, in: Über Künstler und Kunstwerke, vol. 2, 1867, pp. 77-80. While stressing the painting’s high quality and establishing its close relationship to the drawing of the Pietà Michelangelo was said to have executed for Vittoria Colonna, on this occasion Grimm simply claims that there isn’t enough evidence to support an attribution of the painting to Michelangelo himself – and proceeds to ascribe it to Marcello Venusti instead. Grimm provides more insight on why exactly he dismissed Michelangelo’s authorship in his 1868 article “Ein Oelgemälde Michelangelo’s” – which, by the way, was published in a journal called Jahrbücher für Kunstwissenschaft. It ought to be said that this journal never appeared in an English language version, so I must confess I’m rather baffled by the fact that anyone would render the journal’s title in English without at least including the German original – apart from the fact that the translation provided by Mr. Kober (“The Yearbook of Art & Science”) is incorrect, it makes it hard to actually find and consult Grimm’s article. Anyway, once you’ve found it, the 1868 article begins with Grimm saying how in his article of the year before he had ascribed the Ragusa Pietà to Venusti. He then goes on to explain that he had dismissed Michelangelo’s possible authorship on the basis of Vasari’s claim that Michelangelo only did a drawing of the subject, and of the conviction that Michelangelo didn’t execute any panel paintings at all (at least not after the earliest phase of his career). But then Grimm points out that he has since come across Vittoria Colonna’s letters, published by Campori in 1866, that they have made him change his mind and that he now believes the Ragusa panel to have been painted by Michelangelo himself. @historienerrant - cheers for the clarification. Alas, the perils of working with translations! I will edit the piece to include the original title of the journal, and the clarifications of the contents of the journal article. From your account, it makes sense that the clarification appeared after the publication of Colonna's letters. It should be mentioned these points are also not fully extrapolated in Forcellino's account. Getting the dates of how did what and in which year was extremely fiddly on this occasion - I thank you for your input! @historienerrant - Excellent and Thank you! @Hasan Niyazi - Being a longstanding reader, I am very aware of your overriding intrigue in Raphael's work, which I can appreciate! As my main interest lies in Michelangelo's, I have already read texts by Forcellino ("Tormented Life" and "Lost Michelangelos") but I can tell you that they do not discuss or even refer to the letter (of 1543?) that describes the 1543 meeting. This is why I requested your kind assistance. As your readers might want to know more about this letter, I will definitely write if I come across more info. I apologise for consuming your time. I really look forward to the reviews you plan to make! Once again, well done for the above summary! @Anon/N - I am trying to source this reference for you - I will post it here if anything definite turns up. @historienerrant--"Overbearing smartassery" is quite an enviable turn of phrase for someone whose native language is not English (or American, actually!) On a more serious note, your assessment of the German publications is very valuable indeed. And it underlines the fact that German speakers often know English well, but the reverse is seldom true. This has had an unavoidable effect on the quality of scholarship, particularly since Art History was primarily a German study for so many years. Good point Ed! Who else knows what other treasures lie lurking in a late 19C German journal! In "Über Künstler und Kunstwerke", (1865, Ferd. Dümmler Harrwitz) Grimm describes the picture, which has been sent to him from Ragusa to Berlin. He then attributes it (as a work of quality) to Venusti. Grimm then (in 1866) connected the painting with a letter from Vittoria Colonna to Michelangelo, recently found by Campori. The words of Vittoria Colonna finally convinced him about the authorship of Michelangelo: In this letter, Vittoria Colonna praises the figure of the "angel to the right hand of Christ, which is the most beautiful part of the painting". So, the explanation for Grimms attribution becomes quite visual ! Even for a german native speaker Grimms Text from 1866 might lead to missunderstandings, because in his text he mixes up the description of the painting with a reference to the etching, this to explain the meaning of the picture with the inscription of the etching: "Non vi si pensa quanto sangue costa"
@Anon - Many thanks for your input. If you follow the link to "Über Künstler und Kunstwerke" in the refs you can clearly see a publication year of 1867 on the scan of title page - had it also been published in 1865? The gutenberg citation you have provided seems a full text transcription, I'd like to see which year/version that text was taken from. If we can source a scanned version of the the 1866 version that shows this passage then I'd be happy to make any alterations in the post - though at this stage am inclined to go with Christian's analysis. I received a scan of the mentioned article "Künstler und Kunstwerke" from the University library Innsbruck. I could send You the copy of this PDF if I would know Your mailadress. The date of this document, which I have yet no reason to doubt, is definitely the year 1865. Grimm then says, that the picture is here (in Berlin) at present. In the later text that I gave the link, Grimm says: "But now Earl Campori published some letters of Vittoria, that point out that not only a drawing, showing the Crucified, but also a painting exists, and occasionally shortly before the letter (From C. to M.) the painting iself came to my eyes." The letters of Campori, Lettere artistiche inedite, Modena has been published in 1866. Hello Anon. Thanks for these details. So it seems the "Kunstwerke" article was published in 1865 and 1867? Fascinating! The issue now is whether the first mention of the piece in Grimm's Michelangelo biography is in 1866 or 1868 as Christian has indicated. I have found the mention of it in 1868, in vol 3 on pp.162-164 (see refs) - Can we please confirm it is/is not in the 1866 version of "Leben Michelangelos" - I have not been able to find a scan of it, or reference to it. My email address can be found in the "about" page from the top tab. @ Anon: “Über Künstler und Kunstwerke” was a short-lived journal edited (and mostly written) by Herman Grimm. Only two volumes were ever published, the first in 1865, the second in 1867. Both are available on google books, and while the 1865 volume contains plenty of material on Michelangelo neither a full text search nor a thorough look at the index has made me find any reference to the Ragusa panel in it. I believe the confusion about the publication date of the article may simply be due to the fact that – according to their online catalogue – Innsbruck University Library has bound *both* volumes of the journal together. My guess would therefore be that they correctly scanned the article from volume 2/1867 but erroneously scanned the title page from volume 1/1865 because it was at the front of their copy. Your hypothesis about what has happened with the covers is sound - I will wait to see if the Anon contributor sends me a scan. I think the key date here is 1866, as this is when Campori's work was published - but did Grimm see the panel and *first* comment on it? I would very much like to sight the 1866 version of the biography just to make sure - did you see it? @ H Niyazi: As mentioned above, the first three German editions of Grimm’s book were published 1860/63, 1864 and 1868. The only 1866 version there is is the fourth (slightly revised) edition of Bunnett’s English translation, and yes, I did consult this version – it’s available on archive.org (here’s the link: http://www.archive.org/stream/lifemichaelange02grimgoog#page/n324/mode/2up). On p. 311-312 it features a discussion of the *drawing* made for Vittoria Colonna but the entire section dedicated to the Ragusa panel and to the letters published by Campori in 1866 is still missing. And there can be no doubt that these lines were not only published but also written in 1868 because a little later on that same page Grimm refers to Campori’s 1866 book as having been published “two years previously” (“im vorvergangenen Jahr”). I just wanted to thank you for this excellent article - and also to thank you for mentioning my translation! Antonio's book, "The Lost Michelangelos", was fascinating to work on, especially because it overlaps with my own area of research. Many thanks again - and also to @ Anon for the interesting comments and corrections to the chronology of Grimm's comments. @Dott Byatt - As an art student, I really enjoyed reading your translation of Forcellino's book. Complimenti! Translation is a task that can never be easy. I'm not sure if you read the comments beneath Mr Niyazi's splendid text here, but I, and perhaps others here too, am extremely interested in finding information about a letter describing a 1543 'Spirituali' meeting attended by Michelangelo that was recently discovered by Dr Forcellino and was published only (to our knowledge) through a film called 'Michelangelo Revealed' (skip to 39th min of the PBS film at http://www.pbs.org/wnet/secrets/episodes/michelangelo-revealed/226/). Your blog was unknown to me, and it, like this one, is going to be frequently read by me! After all, the facts are true, that the first pubic mentioning of the attribution to Michelangelo was in 1868. But the text must have been written shortly after the letters hs been published by Campori. So the first public mentioning of the pieta probably happened in 1865 - before Camporis edition, the attribution shortly after this date. Grimm (or his lecturer) might have seen the obvious chronological relation between the dates of Camporis (1866) and Grimms (1868) edition and corrected only that part into “two years previously”. 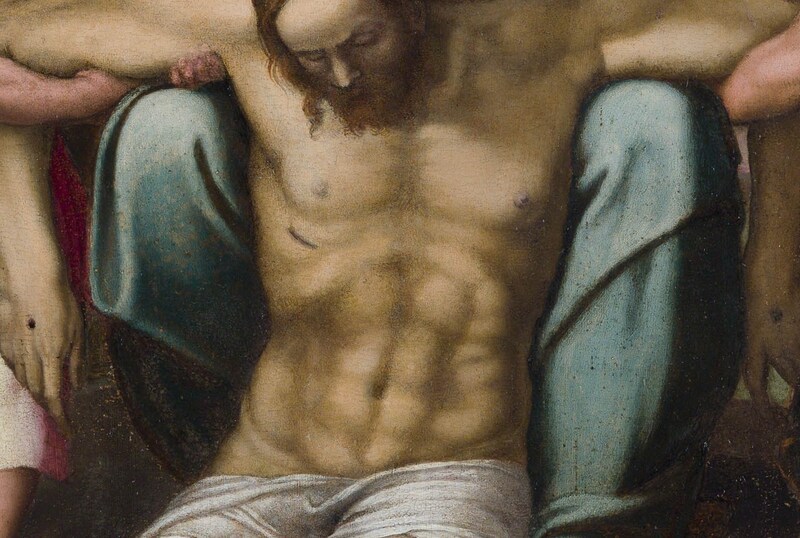 Another question: Is that underdrawing of the body of Christ the real underdrawing of the painting or is it just to compare ? Many thanks for the clarifications. Indeed 1866 seems to be the key date, with Campori's publication of the letters seeming to have nudged Grimm's opinion over the line with regards to the attribution. @Dr Bock - the image is taken from Forcellino's presentation at Accademia Linzei - it compares a known Michelangelo anatomical drawing(left) with the undersurface image from investigations done at the University of Buffalo, New York. I will edit the post later to clarify this. @Lucinda Byatt - many thanks for stopping by - and superlative work on Antonio's book! Professional translators are unsung heroes in my book, so I make sure to mention their contributions! @H - how great are you!?! I'm sure we all could learn from your information on this utterly mysterious unpublished letter here (but credit to the great Forcellino for finding it of course). Unless there is a need for you to communicate privately, we could discuss it in full here. Also, I'd have wasted everybody's time otherwise!! On a related point, Grimm's handwritten letter as seen on the owner's site could do with a transcript and translation. I hope this will be added if it exists. How disappointing. Your reasons for not disclosing the info escape the title of this very article, and your attitude betrays the alleged mission of this site as described by you yesterday. Thank goodness I'm anonymous. You knew I wouldn't send you an email - which would obviously betray the purpose of my anonymity here (you gave us the option in the first place). Confirmed or unconfirmed, your info can be important, and even to the Kober painting which you of course haven't yet noticed (it's a product of Spirituali doctrine for goodness sake!). I didn't ask you to divulge the source of your material. This is the reason why "Anonymity" exists. @Anonymous: Of course, as you say, Grimm’s 1868 article “must have been written shortly after the letters had been published by Campori”. But the question is: How do you define “shortly”. Because, to be more precise, Grimm’s text must only have been written shortly after *he got hold of a copy of Campori’s book* – which, in the 1860s may have taken him quite some time. This may be exemplified by the case of Cesare Guasti’s edition of Michelangelo’s poems: Bearing the publication date 1863, it was actually published in February 1864. However, a year later, in early 1865, Grimm still hadn’t been able to obtain a copy even though he knew of the book’s existence, a fact he attests on two different occasions: 1) In a letter written to his English translator F. E. Bunnett, published in the Preface of the 1866 (and subsequent) edition(s) of the English version “Life of Michael Angelo”, and 2) in the April 1865 issue of “Über Künstler und Kunstwerke” where he then embarks on a short rant about how hard it generally was to come by new Italian language publications in Berlin and how one usually had to wait several months for new books from Italy to arrive. What’s more, Campori’s book was published by a small publisher in the (comparatively) small town of Modena in an edition of only 250 copies, and it’s questionable whether news of its appearance had even reached Germany before it was announced in the January 1867 edition of the “Allgemeine Bibliographie. Monatliches Verzeichniss der wichtigern neuen Erscheinungen der deutschen und ausländischen Literatur“, Germany’s then leading bibliographical journal published by F. Brockhaus in Leipzig. All in all, we can’t be sure therefore whether Grimm had even heard of Campori’s book until several months after its publication, and it seems highly likely that he didn’t get to read it before 1867. What a post! And the comments constitute a second post, in and of themselves. I actually thought about the New York Pieta a few times today, as I was writing my own post on Michelangelo's Duomo Pieta. Your discussion of the pentimenti is especially interesting to me, since the "unfinished changes" might indicate a work by Michelangelo. Many thanks for the comments. It's an interesting point you raise, I can not remember any lengthy comparison to the Bandini/Duomo Pieta in Forcellino's presentation. Another source that may yield further insights is Alexander Nagel's "Michelangelo and the reform of Art" - which has a section devoted to Michelangelo's "Late Pietas"
Have any of the experts produced a formal reply to Dr Forcellino? This is a very interesting case. Thanks for the summary -- very useful! And the many and lengthy comments are just as interesting!!! Well done many many times. Greetings anon! As mentioned, no formal or published response has been issued, apart from the Hermann-Fiore comments on looking at some of the clumsier parts of the execution of the Ragusa Pieta. There has been some energetic (and in some instances unusual) comments made at symposia, though the current status quo seems to be a tentative "acceptance of the possibility" pending further investigation and restoration. The catalogue for the Roman exhibition which is currently showing the piece sums this up with its "?Michelangelo" description of the Ragusa Pieta. For a work to be admitted to an exhibition as a possible attribution seems a major step in the way works seek to achieve public (and professional) acceptance - not unlike what we saw with Salvator Mundi in London. I'm most eager to hear what Alexander Nagel has to say on the matter - and how these findings gel (or not) with the "presentation drawings" theory he put forward in his Cambridge publication. Yes, very intriguing, I agree entirely. Good work H Niyazi! Please update us when you have more information! I also very eager to receive Prof Nagel's opinion. Michelangelo is such a powerful artist, to me the most important. He so radically reformed my idea of what it means to be a human. But, as we see here, he is too complex! @N/Anonymous - For Feb 10. I just found your "how disappointing" response swimming in the spam folder and have restored it here. Firstly, I am sorry you found the response disappointing. Further investigation has revealed that this revelatory letter which Forcellino has discovered has actually not been published (as far as could be determined by persons consulted). You may want to contact Mr. Forcellino directly. Sofonisba Anguissola, Titian and Tintoretto', Giulio Romano. Atti del convegno Internazionale di studi su Giulio Romano e l'espansione europea del Rinascimento, Mantua, Palazzo Ducale, Teatro scientifico del Bibiena, 1-5 0ctober, 1989, Mantua, 1991. I respectfully disagree that the letter is of direct relevance to the attribution - what would be more relevant would be a document further describing a Pieta panel in the posession of Cardinal Pole, for example - rumored to exist, but unconfirmed and unpublished. Saying the paintings were a "product" of Sprituali doctrine is not as clear cut as you have made out - Michelangelo's involvement in this movement is still the subject of great debate and disagreement. The question as to why it has not been published if it was indeed so important also needs to be asked. Hence, it was clearly stated from the outset that a detailed exploration of discussion around the Spirituali was beyond the scope of this text. My primary goal was to describe the data presented on the attributions in a publicly accessible manner. I'm sorry if this disappoints. There is one small detail I have been able to somewhat clarify already, i.e. the question when Grimm got to read Campori’s edition of Vittoria Colonna’s crucial letter. Perhaps I ought to explain first that "Über Künstler und Kunstwerke“ had started as a monthly periodical in 1865, but in 1867 it only appeared six times a year, a double-issue being published every two months. Now Grimm’s first article on the Ragusa Pietà appeared in Über Künstler und Kunstwerke, vol. 2, 1867, issue III/IV, i.e. in March or April. Grimm then goes on to say that, so far, he had only perused the book but was going to publish a more extensive review sometime in the future. The important bit here is, of course, that Grimm says he only got Campori’s book the year *after* it was published – which proves that he couldn’t have known about Vittoria Colonna’s letter before sometime in 1867. All in all, I’d say it’s most likely therefore that he saw the Ragusa Pietà either in early 1867 or, maybe, in late 1866 but definitely no earlier than that. Many thanks to Christian Opitz/historienerrant for the clarification, particulary the mention of Grimm's second entry in "Über Künstler und Kunstwerke“ which clarifies when he saw Vittoria's letter via the Campori volume. These details have been updated in the article/references. It definitely seems like Grimm's involvement needs further clarification that the detail presented in Forcellino's accounts. If anything further turns up - it will be updated here. Many thanks to all for their interest and contribution to this fascinating discussion.